Fear the Walking Dead Panel - Follow Along the Live Blog! Follow along with our Fear the Walking Dead panel live blog! We’re back in Hall H today with more from Comic-Con International 2016! At 12:00 p.m. Pacific Time, AMC is kicking things off with their Fear the Walking Dead panel, featuring stars Cliff Curtis, Kim Dickens, Frank Dillane, Alycia Debnam-Carey, Lorenzo James Henrie, Mercedes Mason, and Colman Domingo alongside executive producer and showrunner Dave Erickson, executive producer Robert Kirkman, executive producer Gale Anne Hurd, executive producer Dave Alpert, and special effects makeup supervisor and executive producer Greg Nicotero. SDCC’s Fear the Walking Dead panel will discuss where the series left off in May’s finale and what to look forward to when it returns Sunday, August 21. SuperHeroHype is on the scene in San Diego and we’re live blogging the whole event! Check it out in the embedded blog below for live updates and check back all weekend for up to the minute coverage of SDCC 2016’s biggest events. 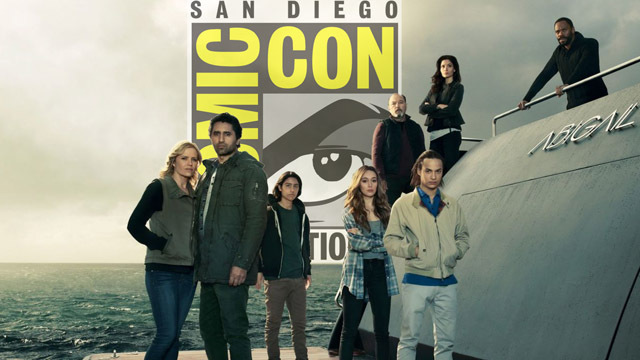 In addition to the Fear the Walking Dead panel, SDCC is offering a Fear the Walking Dead yacht, located at Fifth Avenue Pier behind the Convention Center. The yacht will be open to attendees for the duration of Comic-Con, giving fans a chance to experience life aboard the Abigail. Click here to visit our Comic-Con Coverage hub and stay up to date with SDCC 2016’s biggest reveals, announcements and other surprises!